Senior linebacker Collin Ellis (45) played only four games this season as he battled multiple concussions. 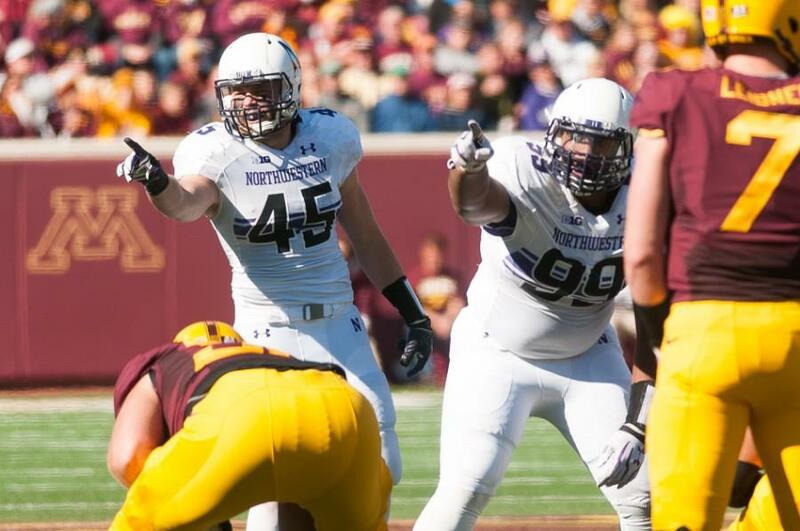 Coach Pat Fitzgerald announced Monday that Ellis will retire from football. Northwestern senior linebacker and team captain Collin Ellis will retire from football, coach Pat Fitzgerald said Monday at his weekly news conference. Ellis missed four games this season, including the last three, after suffering multiple concussions. He recorded 33 tackles on the season for a total of 147 career tackles. The highlight of Ellis’ career came in last year’s season opener against California, when he returned two interceptions for touchdowns in NU’s 44-30 win over the Golden Bears. Fitzgerald praised Ellis’ leadership, saying he has taken a mentoring role with freshman Anthony Walker, his replacement at middle linebacker. Ellis becomes NU’s third defensive player to retire this year, following Daniel Jones, who retired because of a knee injury, and Dwight White, who retired after learning he had a rare kidney condition.